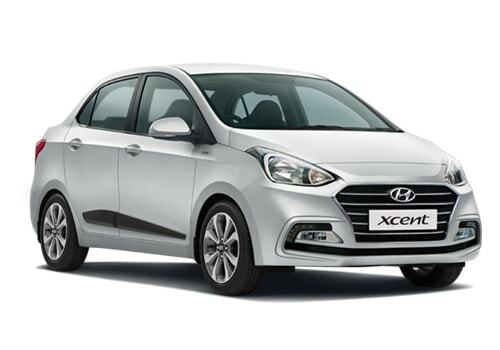 September 12, 2017: Hyundai Motors India limited has launched the Prime CNG variant of compact sedan Xcent in Indian car market with price tag of Rs. 5.93 lakh for its T variant and Rs. 6.12 lakh for its T+ variant. The newly introduced CNG variant is launched with company fitted CNG kit and is reported to explore its presence in taxi segment. Under the hood it is empowered with 1.2 litre four cylinder petrol engine that is capable of boosting the power of 82 bhp and mated with five speed manual gearbox transmission system. 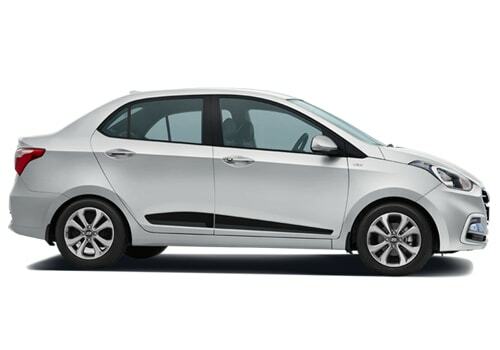 April 13, 2017: HMIL the Indian arm of Korean car maker Hyundai Motors has commenced the bookings of 2017 Facelift Xcent with down payment of Rs. 11,000. Mechanically the facelift Xcent will receive the change in diesel variant replacing 1.1 litre engine with 1.2 litre CRDi diesel engine, but continue with existing 1.2 litre Kappa Dual VTVT petrol engine. The major changes will be introduced on both exterior and interior front. 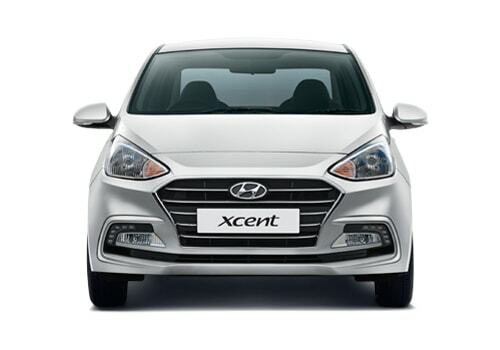 February 3, 2017: It is reported that Hyundai India, the Indian subsidiary of Korean car maker Hyundai Motors is going to launch the facelift version of its compact sedan Xcent sometimes during the Indian car market. According to reports spies have caught the prototype of the same being tested on Chennai roads recently. The facelift Xcent will undergo cosmetic updates along with introduction of 1.2 litre three cylinder diesel engine replacing the existing 1.1 litre three cylinder diesel engine, the petrol variant will continue with its existing 1.2 litre four cylinder engine. November 24, 2016: According to recent reports HMIL, the Indian arm of Korean car Hyundai Motors is going to launch the first facelift version of compact sedan Xcent in March 2017. The refreshed version of Xcent is reported to get vital changes that will help in making it the preferred choice of car enthusiasts in Indian car market. The first generation of Xcent failed to enjoy the expected success due to few drawbacks on both front and rear portions. May 17, 2016: With an objective to celebrate successful existence in Indian car market for two decades Korean car maker Hyundai Motors has launched the Special Edition of its compact sedan Xcent in Indian car market priced Rs. 6.22 lakh for petrol version and Rs. 7.15 lakh for diesel version (both prices of ex-showroom prices, New Delhi). The Special Edition of Xcent receive subtle cosmetic changes and continues with existing engine configuration offered in both petrol and diesel variants. According to reports only 2,400 units of Special Edition will be sold in market. March 30, 2016: It is reported that to celebrate twenty of its successful existence in Indian car market HMIL is going to bring Special Edition of its compact sedan Xcent in Indian car market sometimes during the month of May this year. The special edition will bestow some cosmetic updates like special floor mats, parcel tray, seat covers, sport pedals, and door sil plates and will continue with existing engine configurations in both petrol and diesel variants. 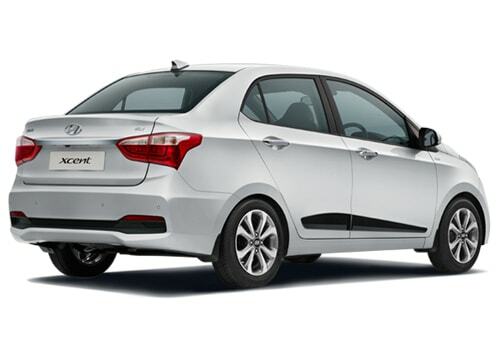 January 6, 2015: It is reported that HMIL is going to introduce the base variant of its compact sedan Xcent with minute modifications for cab operators to compete against Maruti Suzuki Swift Dzire Tour developed strictly for taxi purpose. The new version of Xcent’s base variant will however miss some out of the features like front power windows, cooled glove box, full wheel caps, central locking system and black colored pillars being offered in regular trim of base variant. As far as engine configuration is concerned it is reported to continue the same engines as offered in existing versions of petrol and diesel variants. 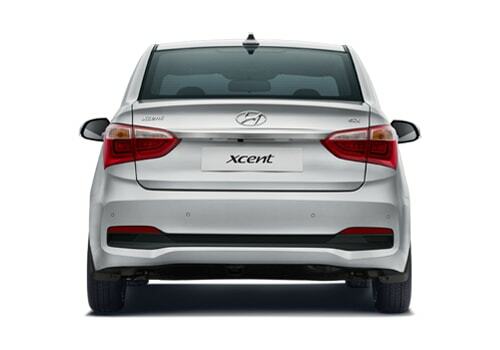 May 19, 2014: With an objective to reduce the waiting period of its recently launched compact sedan Xcent, Korean car maker Hyundai Motors is working on increasing the production to meet the requirements of customers and to retain them from moving towards other optional products. Apart from this company is looking for other markets where it can export the compact sedan. 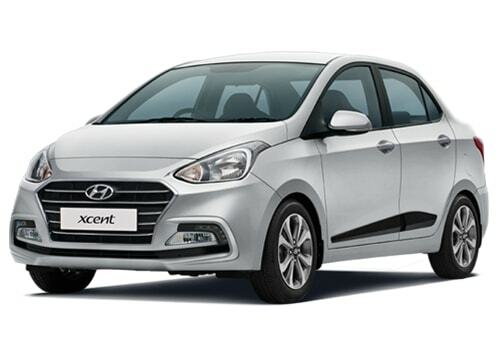 April 15, 2014: South Korean car maker Hyundai Motors is all prepared to launch its recently launched and highly appreciated compact sedan Xcent in Nepal by mid of July this year, through its national distributor. Like Indian car market in Nepal also it will be launched in both petrol and diesel variants, with petrol variant be equipped with 1.2 litre Kappa Dual VTVT engine and diesel be equipped with 1.1 litre U2 CRDi diesel engine. 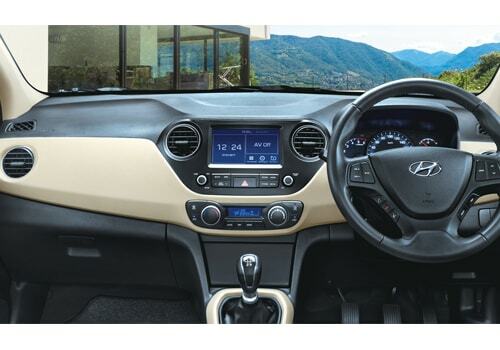 March 12, 2014: HMIL has launched its highly awaited company sedan Hyundai Xcent aka Grand i10 sedan in Indian car market with starting price of Rs. 4.66 lakh (ex-showroom price in New Delhi). The sedan has been launched in both petrol and diesel versions both coated with five manual transmission system followed by four speed automatic transmission system in petrol version. The petrol version will deliver an average of 19.1 kmpl while the diesel variant will deliver an average of 24.4 kmpl. The new Xcent will compete against existing compact sedan like Swift Dzire from Maruti, Honda Amaze, Mahindra Verito and others. 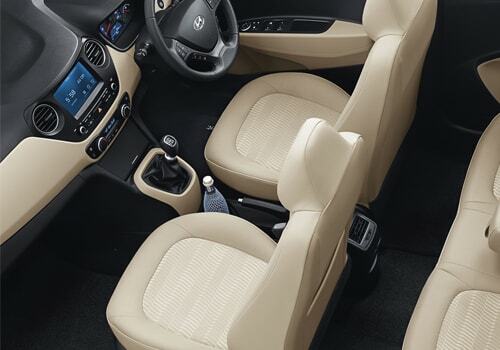 The Hyundai Xcent sedan from Korean is one of the highly awaited sedan’s in Indian car market for this year. The car was showcased during the Indian Auto Expo 2014 held in month of February after which car enthusiasts were eagerly waiting for its launch. 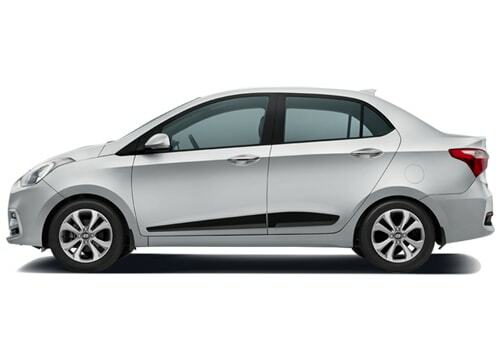 The car is mainly based on the platform of its elder sibling Grand i10 hatchback which was launched last year and which also received over whelming response from car buyers in Indian car market. The sedan has been launched in both petrol and diesel disguises. The petrol variant is equipped with 1.2 litre Kappa dual VTVT engine with displacement capacity of 1197cc churning the power of 82 bhp at 6,000 rpm and torque of 114 Nm at 4000 rpm. On the other side the diesel variant is offered in 1.1 litre U2 CRDi diesel engine with displacement capacity of 1120cc developing the power of 71 bhp at 4000 rpm and torque of 180 Nm at rpm varying from 1500 rpm to 2750 rpm. Both engines are offered with five speed manual transmission system followed by option of availability of four speed automatic transmission system in petrol variant. With high defined features and improved fuel efficiency figures the Hyundai Xcent has ability to be a tough contender to existing compact sedans especially Maruti Swifti Dzire, Honda Amaze and others as far as fuel consumption figures is concerned. Hyundai Xcent Base This is the base variant in petrol version of Xcent which is equipped with 1.2 litre Kappa petrol engine with displacement capacity of 1197cc. The standard features offered in this model are AC unit, glove box cooling, passenger vanity mirror, internally adjustable external mirrors, an engine immobilizer and central locking system and many more. Hyundai Xcent S Apart from being blessed with same technical features as offered in base variant this variant is equipped with features like driver seat height adjuster, passenger vanity mirror, tilt steering, luggage lamp, power windows with driver side auto down function, front passenger seat back pocket, turn indicators on outside mirrors, waistline molding, body colored outside door handles and ORVMs etc. 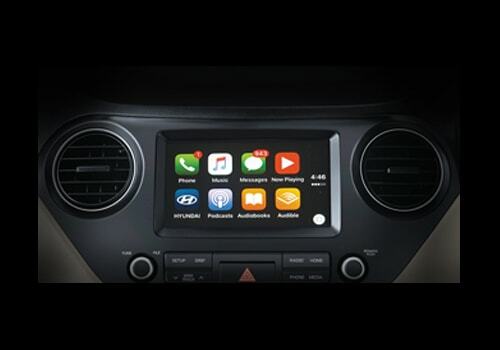 Hyundai Xcent SX Major features offered in this variant are automatic air conditioning system with climate control, rear AC vents, push button engine start/stop function, front and rear power outlets, leather wrapped steering wheel, smart key less entry, and more. Hyundai Xcent S Option Besides carrying the features offered in S Variant this variant also carries features like tubeless radial tyres and the advanced anti-lock braking system. Hyundai Xcent SX Option The impressive feature adorned in this variant besides the features similar to SX variant is integration of anti lock braking system which enhances the braking system of this sedan. Hyundai Xcent AT S Option Besides being blessed with four automatic transmission system impressive features added in this automatic version include anti-lock braking system and 14 inch alloy wheels. Hyundai Xcent Diesel Base Powered with 1.1 litre CRDi diesel engine with displacement capacity of 1120 cc developing the power of 71 bhp at 4000 rpm and torque of 180.4 Nm at rpm from 1750 to 2500. This variant delivers an impressive average of 25.1 kmpl. Standard features adorned in this model include ) power steering, manual air conditioning system with heater, a cooling glove box, front power windows, front power outlet, internally adjustable external mirror, passenger vanity mirror, engine immobilizer, central locking system and many more. Hyundai Xcent Diesel S Major features offered in this variant are electrically foldable and adjustable external mirrors, power steering with tilt column, driver seat height adjuster, all four windows with driver side auto down function, front and rear power outlets, a 2-DIN audio system with 1GB internal memory along with steering mounted Bluetooth and audio controls, rear defogger, front fog lamps, reverse parking sensors. Hyundai Xcent Diesel SX It is equipped with standard features like push button engine start/stop function, leather wrapped steering wheel and gear knob, chrome outside door handles, smart key less entry, driver and passenger airbags, electro chromic internal rear view mirror and a rear parking assist camera with display on the ECM. Hyundai Xcent Diesel S Option Along with features offered in S variant this variant carries features like tubeless radial tyres, anti lock braking system, 14 inch alloy wheels etc. Hyundai Xcent Diesel SX Option The major features offered in this variant are 15 inch diamond cut alloy wheels and high defined anti lock braking system. 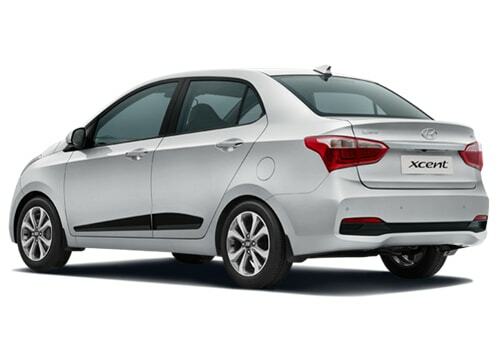 The new compact sedan Xcent has been offered in dynamic Phantom Black, Pristine Blue, Pure White, Twillight Blue, Sleek Silver and Passion Red colors. The compact sedan has been offered in both petrol and diesel disguises. The petrol variant is powered with 1.2 lire Kappa dual VTVT engine which displacement capacity of 1197cc, developing the power of 82 bhp at 6000 rpm and torque of 114 Nm at 4000 rpm. The petrol variant is offered with two options of gear transmission system, one with five speed manual gear transmission system while the other with four speed automatic transmission system. 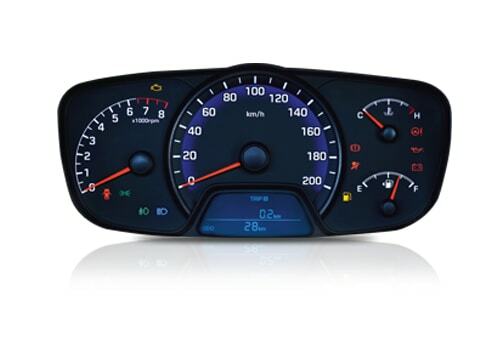 The petrol variant delivers an average of 16.5 kmpl on urban area and 20.1 kmpl in urban areas. The diesel variant is powered with 1.1 litre U2 CRDi diesel engine with displacement capacity of 1120cc developing the power of 71 bhp at 4000 rpm and torque of 180 Nm at 1500 rpm. The diesel engine is available with 5 speed manual transmission system. The diesel version on the other side delivers an average of 19.5 kmpl in urban areas and 25.1 kmpl on highways. The average delivered by both variants is quite impressive especially in current scenario when price of fuel are rising at jet dynamic speed. 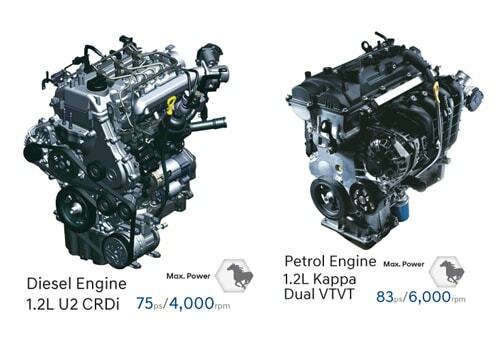 The both variants of Xcent are equipped with powerful engine options. The petrol version accelerates the speed from standstill to 100 kmph at the span of 16 seconds and can achieve the top speed of 155 kmph. While the diesel variant accelerates the speed from 0 to 100 kmph in 17 seconds and achieves the top speed of 160 kmph. The interiors of sedan have been developed with dual tone color scheme of black and beige which grab the attention of passengers at first instance as soon as they enter inside the cabin, with this the material used is of high quality which gives it a royal look. The major impressive features offered in the interiors include high performing air conditioner, power window operated from driver seat, speedometer and fuel indicator, high defined 2 DIN music system with steering mounted control supporting connectivity with Bluetooth, rear seat center armrest, cup holders and various others. Although the new sedan is developed on the platform of its sibling hatchback Grand i10 but still its looks quite different from it. 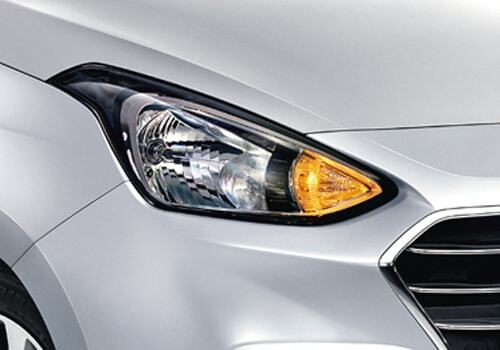 Talking about the front fascia the headlight cluster is developed with chrome plated radiator grille followed by Hyundai’s badge at the centre. The body colored bumper integrates trapezoidal air dam garnished with chrome. 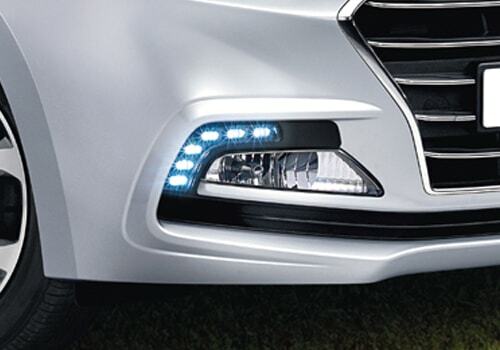 The bumper also adorns fog lamps which further enhance the looks of front fascia. 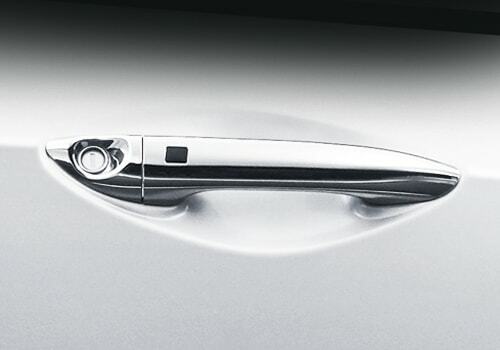 Moving towards the side profile, the door handles have received chrome treatment, but this feature is offered in the top end variants, while the base variant is offered with black colored door handles. On the rear side the tail light cluster play an interesting role in giving the rear portion a unique look. Like the front bumper the rear bumper has also been given body colored treatment followed by reflectors giving it a sportier look. 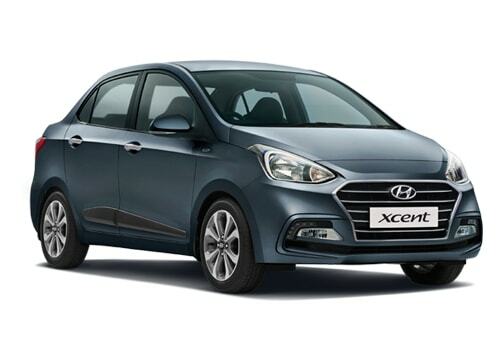 The Xcent sedan of Hyundai is also bestowed with necessary safety measures which will protect the passengers at the time of some uncertain crashes. The front portion of interiors is equipped with air bags. 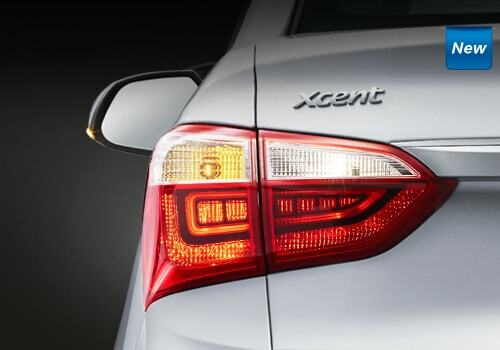 Apart from this other safety features offered in Xcent include central locking system, rear defogger, engine immobilizer system, inside rear view mirrors, front fog lamps, reflectors at rear bumper, rear parking sensors, and smart key less entry. 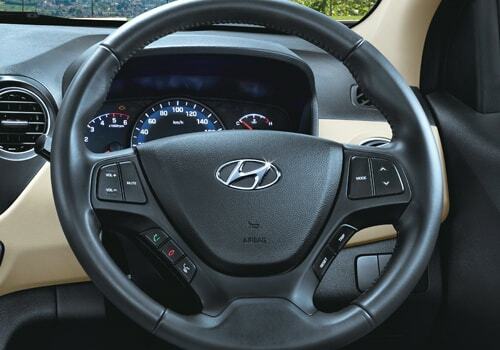 With an objective of providing safe driving to the customers Hyundai has paid proper attention in making the compact sedan a user friendly driving vehicle. 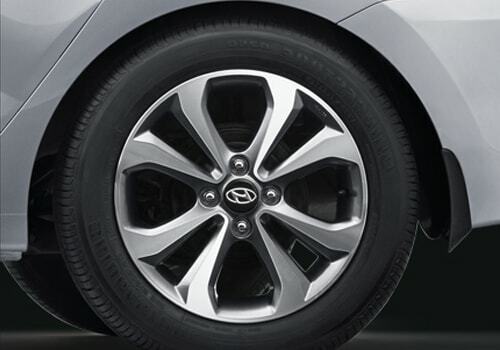 The front wheels are equipped with disc braking system while the rear wheels are offered with drum braking system. Similarly the front axle of sedan is blessed with McPherson strut type suspension system whereas the rear axle is supported with twist beam type of suspension system. 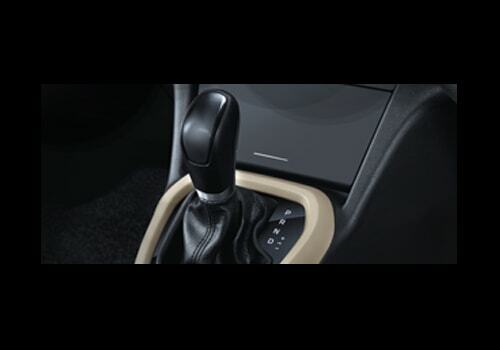 Apart from this the power steering facilitates the driver to smoothly turn the vehicle in desired direction at an ease. Hyundai Xcent is offered with various remarkable fleet of standard accessories including high defined 2 DIN music system with FM radio, CD/MP3 player supporting connectivity with Bluetooth, silver painted door handles, steering wheel wrapped with leather, floor carpet, fabric seat covers and many more. 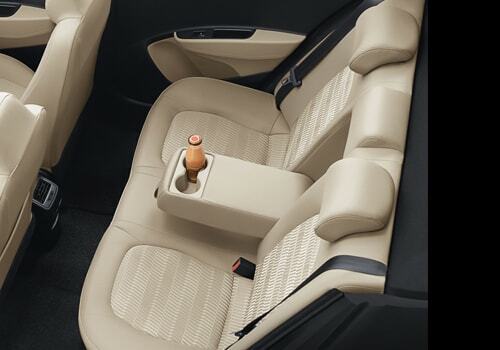 Apart from these standard accessories customers can also add additional features like cup and bottle holders, mobile holders, navigation system, powerful speakers and various other depending upon their requirement and budget. The newly launched compact sedan from Hyundai without any second thoughts is one of the best available sedans available in Indian car market at present. Moreover with spacious cabin and all latest features followed by impressive fuel efficiency figures undoubtedly makes it ahead of its contenders.